Can a killer be tracked in only three days? Benyamin Ben-Akiva, a young Talmudic scholar in Prague, has just arrived from Poland. While conducting his daily duties as a shammes (or servant), he hears the mournful cries of a distressed parent calling for their child throughout the city streets, the sound piercing his heart. A short while later, a young Christian girl is found murdered with her throat slashed in the shop of a Jewish owner. On this night in 1592, the night before Passover, the Jewish community in Prague is suffering the oppression of religious discrimination. Christian "authorities" arrest the Jewish shopkeeper and hold him for blood libel, without any investigation to the crime scene at all. The laws of might overtake right, and with Ben-Akiva being new to the area, there aren't many friends he can count on right now. But without his help, the shopkeeper will not meet a friendly end. There is no option for Ben-Akiva but to ensure that a fair and thorough investigation is conducted. With the help of common sense and scholarly insight, Ben-Akiva begins what almost becomes a modern day crime novel, investigating and searching the crime scene, canvassing areas to talk to witnesses, and piecing clues and evidence together to identify suspects. There isn't much flexibility or willingness by the community, though, to help the investigation proceed. Doubt, mistrust, religious stereotyping - the history of another time ultimately becomes the central focus of this novel. Only at the outset was it slow to keep my attention - while I was enthralled by the imagery Wishnia provided, I was put off by the modernization of the dialogue. And although Wishnia includes an author's note clarifying his reasons for bringing 16th century conversations to a more contemporary approach, I did (only initially) struggle with it. I much prefer historical fiction to be representative (or as closely as it can be, or maybe even how it is imagined it would be) to the actual speech patterns and word usage that are found during that time so it did make it difficult to get into the rhythm of the book. Once I did, though, it was a highly enjoyable read. I appreciate Jewish fiction and especially historical fiction, so to be able to combine the two and then throw a murder mystery on top of that, added to my overall pleasure. While I do wish the mystery played a more central part throughout the story, I could accept that the primary discussion Wishnia focused on was of the interaction and struggles that the Jewish community experienced during this time. The spiritual and personal challenges of Ben-Akiva and others provided fantastic character development, and I enjoyed the insight into these characters. Wishnia does provide a helpful glossary in the back of the book, however he does a fantastic job of sentence structure to contextualize it so that you may not need to use the glossary. Richly described and exuding the smells and sounds of what 16th century Prague surely must have been like, Wishnia has clearly researched thoroughly for The Fifth Servant , and it is a strikingly beautiful and gritty look into this time period. Whether it is a group of Jesuits walking on the cobbled streets, or a tough scene of torture and interrogation of a potential "witch," Wishnia has superbly captured scenes so vivid that in several instances, a moment of reflection was needed before proceeding. I look forward to more of his work. Visit the author's website by clicking here. This sounds really interesting. Just added it to my TBR list! I love the sound of this one; thanks so much for the great review. It seems like we've been struggling to get past religious differences for centuries and I can't help but wonder if we ever will. The book sounds fascinating. I love it when mystery thrillers also teach you something, and take place in an interesting setting. This is what it takes to make the book memorable. Great review! I am glad that after your initial struggle with this book that it picked up for you. I thought Wishnia did an incredible job making the time period and the issues come alive for me, but I do also think that the murder was not the central thread in this story. As I have mentioned before, I think his scholarship was amazing, and I learned so many new and interesting things from the book. I love it when historical fiction edifies like that. Wonderful review, Natalie! What Kathy said! I don't want to be pessimistic, but it's certainly taking us a long while to learn. Anyway, I really like the sound of the book. mummazappa - So glad you'll be checking it out! Let me know what you think once you've read it! (Diane) Bibliophile By the Sea - I hope you enjoy it! bermudaonion - You're absolutely right, Kathy. Religious differences and theological debates never seem to just meet at a halfway point and compromise. I wonder, to, if we'll ever get past these differences and just accept differences. I can only hope and dream! Sandy Nawrot - Yes, those mystery thrillers with history are normally what I'm drawn to at times! And this one was definitely rich with detail! Zibilee - Hi, Heather! And you were so right that it was going to be a great read! Notwithstanding those initial bumps in the road, it was a wonderful story, and I soon got into the flow of it. And yes, Wishnia's scholarly insights were breathtaking and made me want to rush immediately to study a bit more on this! Nymeth - I know, it's such a sad state of affairs - after all, isn't history supposed to teach us to not repeat the past? And although it seems time and time again, history has more than enough events that reflect that we continue to persecute each other for our religious differences. Apparently, civilizations don't learn very well. I hope for a much better future! I love Jewish Historical Fiction and find the history fascinating. I'm adding to my reading list. I appreciate the heads up about the contemporary speech. I might have found it off putting enough not to continue. It's good to know it's worth it. This looks like a good read. Definitely will be adding to my list. I love historical fiction, and I always take up the contemporary speech as sort of a reading challenge. This sounds especially good. I haven't read any historical mysteries in a while. I'm definitley adding this to my list. Now that Ariana Franklin is gone, I'm searching around for a new author or two whose historicals I might appreciate as much as I did hers. Hard shoes to fill. Mugdha - Yes, this is good historical fiction. I hope you enjoy! Yvete - Isn't it awful about Ariana Franklin? I was stunned to hear this news, absolutely stunned. I don't read a lot of historical fiction, but this one sounds like a keeper. Wow this sounds like a gripping read and I do love historical fiction. I'm going to check it out! A few other reviewers mentioned that the beginning was a bit hard to get into but they all agreed with you that once you are in the story it is a real page turner. I know what you mean about wanting the dialogue to match the era - I feel the same way - so I'm glad to know that it didn't end up being an issue for you. Thanks so much for being on this tour. The book sounds truly fantastic and it's one that I definitely plan to read for myself. This sounds a bit interesting. Thanks for sharing. DCMetroreader - This is definitely one to try! Amused - I really enjoyed the historical side of it; I think that was my favorite part! Shooting Stars Mag - Very welcome! If you read it, do let me know what you think! Would have loved to join the tour but I just couldn't squeeze it it. Now I see what a great read I missed out on :( Thanks for the wondeful review and I'm adding to the tbr. This book sounds amazing! I do like history to stick to its time period in all aspects, but everything else about this book sounds compelling! This sounds like an interesting read. And I like that the author included why he made changes...I'll have to add this to my wishlist. Great review! what a fantastic review! i too love jewish fiction and mystery historical fiction so the combination of the two are just like peanut butter and chocolate to me! I will definitely be reading this one! Aths - It was the only part that I felt was a bit of a struggle, but other than that, it was very nicely done and I enjoyed reading it. samantha.1020 - Let me know what you think once you read it! This sounds like an absorbing read, even if, like you, I prefer the dialogue to be accurate according to the time it is set in. Thanks for the review. Julie @ Knitting and Sundries - That was the toughest part for me; once I got into the rhythm of it, I did enjoy it. It took me about 100 pages or so and then I was comfortable with it. What I love about this one is that I can read a good mystery/thriller AND learn something about a time period and place that I am pretty ignorant about. Great review. I also enjoyed this book very much. I have the advantage of understanding Hebrew and some Yiddish and German as well as having the sarcastic sense of humor the protagonist has (and my wife hates). 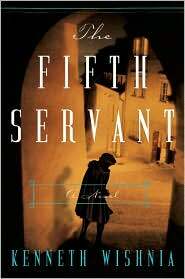 Thanks for the kind words about THE FIFTH SERVANT. I appreciate your insights. If anybody's got a book group out there that would like to read and discuss it, I'd be happy to talk to them in person (in the NY tri-state area) or by speakerphone (longer distances).